China, Myanmar, Thailand, Vietnam and Indonesia. Inhabits medium to large estuarine rivers and their tributaries. Is found in both brackish and full marine conditions. 48″ x 18″ x 18″ (120cm x 45cm x 45cm) – 255 litres. We suggest a sandy substrate, with smooth rocks and driftwood pieces for decoration. Leave plenty of open space for swimming. You can plant the aquarium if you wish but be prepared for bite marks to appear in the leaves if the puffer spots any morsels of food on them. Although it’s often considered a freshwater species, it actually requires the addition of marine salt to a sg of at least 1.005 in aquaria. See below for more information regarding this. Like all puffers, it’s very sensitive to deteriorating water conditions, so regular partial water changes are mandatory. Relishes all kinds of shellfish, as well as worms and other live and frozen foods. It should be fed snails and unshelled shellfish (such as crab legs, prawns etc.) regularly, in order to maintain its sharp teeth. 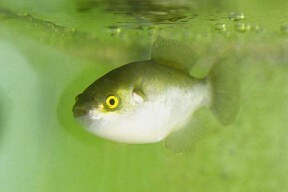 As with other puffers, these grow continuously and become a problem for the fish if their teeth are not kept ground down. An aggressive, intolerant species that requires its own aquarium. It’s beak-like mouth can easily bite chunks from other fish, or in extreme cases rip them to pieces. If you decide to take the risk you will need a huge tank, and tankmates that swim too quickly for the puffer to catch them easily. It is also very aggressive towards conspecifics. Not thought to have been bred in aquaria. Puffer fish are so called as they have the ability to inflate their elastic stomachs with water or air. This is usually a response to some kind of threat though in the aquarium many specimens appear to inflate themselves for no apparent reason. The fish becomes 2 or 3 times its normal size, big enough to scare away many potential predators, or become difficult to swallow. Puffers are also one of the few fish that can actually blink or close their eyes. Many parts of the body of puffers contain the deadly neurotoxin tetrodoxin. This is the same poison found in the notorious blue-ringed octopus. When ingested in sufficient quantities, it can cause paralysis and death. As yet there is no known antitoxin and to humans it is over 1000 times deadlier than cyanide. Grotesquely, the victim usually remains conscious as he or she becomes paralysed. This species is only seen infrequently in the hobby. Despite its unfriendly attitude towards other fish, it can develop into a true pet, as given time, it will interact with its owner. Much of the information available about this fish states that it is a freshwater species and does not require any salt in its water. 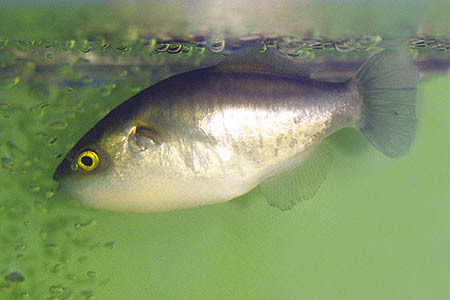 However it appears that it is in fact an estuarine species and the misinformation has arisen from confusion between this and similar looking fish from the Auriglobus and Chonerhinos genera, which are indeed freshwater puffers but have a much smaller adult size than the golden puffer. This is borne out by the fact that all museum specimens of X. naritus were collected in either brackish or marine conditions. It’s also the only species in the Xenopterus genus at the present time.